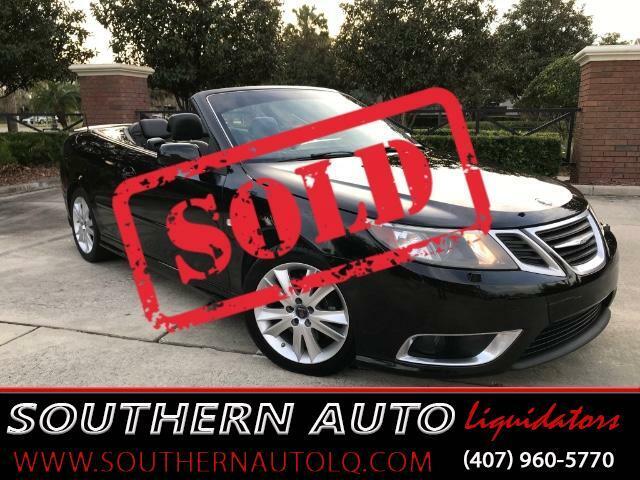 Check out this fantastic Triple Black 2008 Saab 9-3 Aero Convertible. The Saab Convertible has a level of structural integrity, build quality and running refinement that places it at the very top of its class. Wow, this car flows smoothly though the gears, it loves the road, hugging the curves. The Aero models get a turbocharged 2.8-liter V6 capable of 255 hp and 258 lb-ft of torque that delivers a healthy pull throughout their power bands. The 9-3's ride is smooth and quiet. Steering is light and accurate. Innovative product features further develop the Saab concept that an open-top car should be 'more than a Convertible' by offering effective all-year-round transport. The Fabric top is in excellent condition fully lined and insolated and tucks neatly beneath a body-colored tonneau cover, which produces an uncluttered silhouette. Giving a clean elegant line. Rearward vision is impressive for a convertible. In addition to its functional qualities, the Convertible also offers strong driving appeal through sharing the excellent chassis dynamics of the 9-3 sedan. SAAB is responsible for more automotive World First’s than almost any other car company on the planet, but it’s best known for its iconic SAAB Convertible. You can tell this one was loved, the premium black leather is in beautiful condition. The car is just super clean inside and out. You will not likely find another like it offered at such a low price. It’s an Aero so it's totally loaded up, Power Top, Power Leather Interior, Power Windows, Power Locks, Power Mirrors, CD/AM/FM Premium Sound System, Back up sensors, Rear Defroster, automatic climate control, eight-way power seats with memory, illuminated vanity mirrors,Ice Cold A/C, Leather Wrapped Steering Wheel, Corning Lights, Front Fog/Driving Lights, Xenon High Intensity Discharge Headlamps, Front and Rear Ventilated Disc Brakes, Heated seats, Cruise Control, Etc.... Runs and Drives Fantastic, really a joy to drive. Come by Today, You won't be disappointed!!! Drive Fun, Drive Safe, Drive Cool!